Please take care when you schedule a practice match: real matches will always be scheduled ahead of them on your Match Control Box. When you have no more real matches available, your practice matches will then be able to be fished. The TFL Season 5 Sponsored by SimKast has begun! Good luck to all teams involved! TFL teams: your first match is now available, and must be fished before the end of Sunday, February 20th. You also have your week 2 match available to fish if you need to get ahead. Matches will be available 2 weeks before they are due. This season each player gets 119 levels to distribute, which averages out to 7 levels per match. Team Fishing League Season 5 registration ends on Sunday, so be sure to register on time! The TFL is a 10-week 2v2 team fishing league with tons of prizes! Registration costs $500 per player and is located in the Neo-Realms Store in Alston. If you need any help finding a teammate, just let us know! Season 5 Registration is OPEN! Good news! 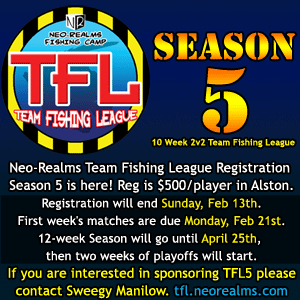 The Team Fishing League Season 5 is open for registration! The TFL is a 10-week 2v2 team fishing league with tons of prizes! Registration costs $500 per player and is located in the Neo-Realms Store in Alston. Info on Season 5 Registration Coming soon! Stay tuned for registration information! If you wish to become a sponsor of the TFL, please contact Sweegy Manilow or Shannah Halberd. We still have the full sponsorship (now $10k) and other categories available.